Bennie Brazell beats Will Herring to catch TD pass. Addai intent on the goal line. 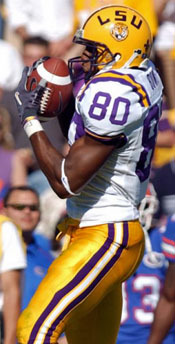 Next, LSU hosted its perennial opponent from the East Division, Florida, to start a string of four home games. 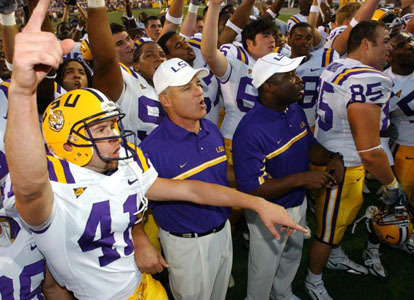 The two teams were similar in that they both had new coaches whose last name begins with "M."
Both fan bases had high expectations for their new leader - Miles to continue the best five-year run in LSU history under Nick Saban and Urban Meyer to return the program to the glory days of Steve Spurrier after three years of mise­ry under Ron Zook. Both men endured heat from supporters for their lone defeat: Miles to Tennes­see in a hurricane-delayed Monday night game and Meyer to Alabama 31-3 in Tuscaloosa. Meyer was attempting to implement the spread offense that had been so suc­cessful for him at Utah (22-2) with only one set of players (freshmen) he had recruited to fit his scheme. 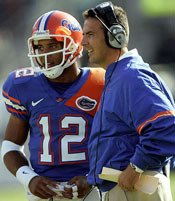 He inherited junior QB Chris Leak, who was transi­tioning to the new system. 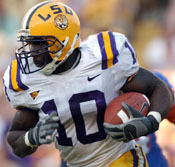 As a freshman, Leak led Florida to the stunning up­set of the Tigers, LSU's sole loss on its way to the 2003 BCS National Champ­ionship. Hoping to end Florida's three-game winning streak in Tiger Stadium, D-coordi­nator Bo Pelini planned to capitalize on the Gators' weakness against the pass rush. The game would kickoff at 2:40 on CBS. It isn't often that a team loses the turnover battle 5-0, yet wins the game. But that's what happened on a bright Fall day before the largest crowd in Tiger Stadium history, 92,402, in a game that saw the two most penalized teams in the SEC live up to their billing. Q1: LSU won the toss and deferred. After the touchback, Leak threw an incom­pletion on the second play, but an interference penalty against Ronnie Prude gave the Gators a first down. But a false start caused UF's new series of downs to end in a punt. 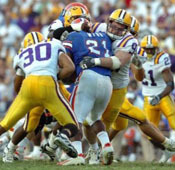 With LSU blitzes confusing Leak, Florida went three and out, but the Tigers couldn't overcome a holding call on G Will Arnold and punted back. Leak completed two short passes on the ensuing possession but, after gaining one first down, UF punted to the 11. 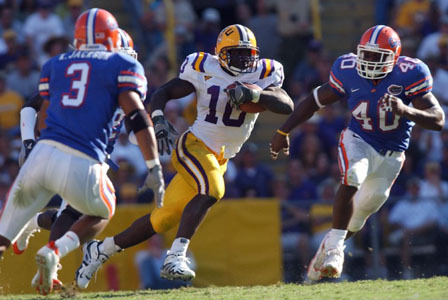 Russell winged a pass to Early Doucet for 24y before Chris Jackson punted to the UF 13. When three plays gained only 6, the Gators sent the pigskin spiraling back but only to the LSU 44, from where the home team got in another fast scoring drive before the period ended. Another interference on Prude gave the Gators a first down. Dwayne Bowe grabs Russell's TD aerial. Q2: Alternating short passes in the face of the LSU rush with handoffs to chunky RB DeShawn Wynn (5'11" 230), Florida moved the chains one more time before punting to the 4. 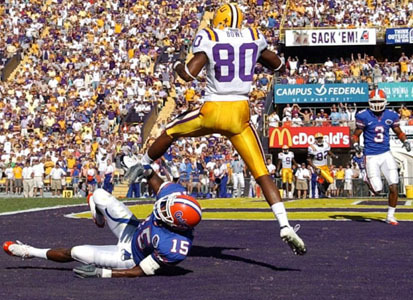 Receiving the return kick at the LSU 47, the Gators decided to go for it on 4th and 1. 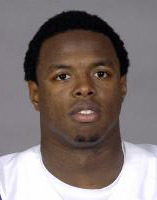 But Prude and fellow DB Jessie Daniels dropped Wynn for a 3y loss. However, the Tigers immediately squandered the big gain in field position when Addai fumbled, and S Jarvis Herring recovered on the 32. The defenses dominated the rest of the half until DE Jarvis Moss sacked Russell and recovered the fumble at the LSU 37 with 1:37 on the clock. But two incompletions and Ali Highsmith's sack fended off the threat. Q3: LSU's offense continued to stifle itself with penalties and other miscues, starting on the opening possession. Another holding penalty on Arnold made it 2nd-and-20. 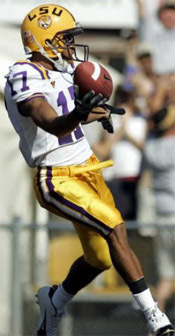 Russell took to the air, but Herring intercepted at the LSU 46. The Tigers embarked on a nearly five-minute drive that took them to the UF 44. A 19y run by Addai helped overcome a 10y sack of Russell. Another 13y scamper by Joseph and an 11y connection to TE Keith Zinger produced two more first downs. 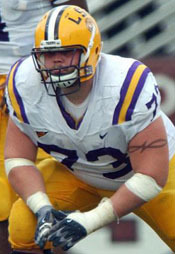 But it all came to nought when Russell threw another INT, this one to DT Joe Cohen, who rumbled to the LSU 32. Russell & Company got their act together and took back the advantage. Starting from the 25, they gained two first downs to the 44 when the quarter ended. A pass to TE David Jones for 12 produced the biggest gain. Addai scores the go-ahead TD. Florida would have the ball four more times but never cross midfield. First, High­smith's second sack, this one on 3rd-and-4, forced a punt. After a holding penalty doomed the home team's next possession, Leak com­pleted a 14y pass to Jemalle Cornelius on 3rd-and-6 to move the ball to the UF 24. But the next three plays netted -2. With the clock reading 5:46, LSU hoped to eat up some time. But when Moss got his second sack on 3rd down, Jackson booted 48y to the 11. Leak completed a 10y pass but successive penalties impeded progress. A crucial play occurred on 3rd-and-13 from the 13. Chris connected with Dallas Baker for 33y. However, offensive pass interference nullified the play. 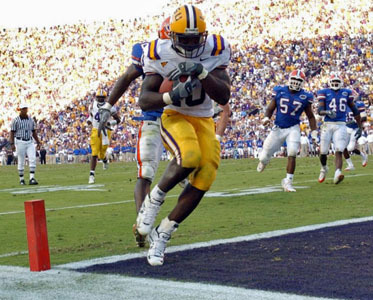 So deep in their ter­ritory, the Gators couldn't go for it and punted to LSU with 1:58 showing. With Meyer using his remaining two timeouts, another holding penalty - on Rudy Niswanger - set LSU back to force a punt that went into the EZ with 0:59 re­maining. Despite their statistical dominance, the Tigers needed one more stop by the defense. Melvin Oliver sacked Leak for a loss of 9, but Chris came back with a 20y completion to WR Chad Jackson who ran out of bounds at the 31. But an incompletion and a penalty left time for only one more play. 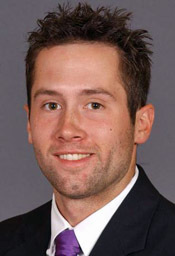 Leak threw to Jack­son, who lateralled to Gavin Dickey. But LB Cameron Vaughn tackled the ball carrier, who fumbled. Vaughn picked up the ball and ran it into the EZ. The score­board showed 27-17 for a brief time until a review showed that the runner's knee was down before he lost the pigskin. Miles: Our defense played extremely well start to finish. As a matter of fact, if you had to give credit for that win to a piece of our team, it would be that defense from start to finish. They played with the same intensity, they played hard, they need to correct some things certainly because nobody plays a perfect game, but our defense came to play. On the other hand, on offense we cannot sustain the mistakes that we made. I will not allow it. We're going to work hard at it. We worked hard at it last week, and we're going to work hard at it again. There's got to be a stronger push and a greater commitment by our team. We're going to fix it. If you turn the ball over the amount of times we did and you have penalties that are unforced, that's just funda­mentals. We will not be able to do the things that this team is capable of doing. This football team has a lot in front of it, if the things that we're trying to eliminate don't stand between us and being a spectacular football team. Right now, we're just a sloppy team on offense. ... But we still must give credit to this team. The fact that they came back in the fourth quarter again and played well enough to win ... It will be a lot of fun coaching this week, and we'll work hard at it. Ronnie Prude talked about the difference in the team from the opening game against Arizona State. We carry more confidence, just carrying out our assign­ments and executing coach's plan. 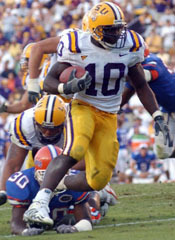 Someone asked if the defense thought about Tennessee's comeback in the previous game in Tiger Stadium when Florida came back to take the lead. No, that's way behind us. We didn't think one time that was going to happen again. We just came out and said we're going to stay focused and play defense. In a locker room that was a tomb of doom and gloom, Meyer said what every­body had been trying to tell him since he took the job at Florida. This is a tough conference. I know I always say that, but ... there is a lot of great defenses in this conference including the University of Florida's. Great environment and for a coach that has not been in the SEC very long, that's what separates the SEC from every other conference in college football. I mean, go to the Swamp, or go here, or go to Alabama. That was a hell of an atmosphere. ... I liked the passion; I liked the way our guys played today. I hadn't seen that a lot out of our team. You'll never hear me say I'm proud of the team, because I'm not when they lose. Meyer paused, his eyes welling up. Then, wiping his face with a towel, he continued. If you can take something from it, it was the way the guys played the game. 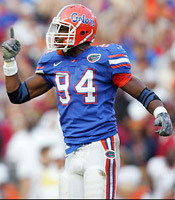 Guys I've never seen actually act like they like to put on a Gator football helmet, act like they wanted to play. I think we toughened up a bit. ... I thought we played excellent defense and created turnovers and gave field position. We're still not executing offensively, cer­tainly not on our throw game, but I thought we recovered for most of the game. Leak finished 11-for-30 for only 107y. Guys have to get open a little quicker. You've got to adjust to their scheme. 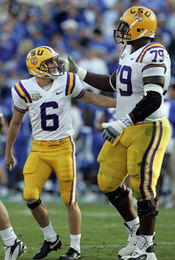 LSU has one of the top defensive lines in the SEC. They did a great job, and you have to give them credit. With many playes shedding tears, Cohen said, It's good to cry at times. It lets you know that people care enough about each other. ... It's hard to lose. We've been grinding so hard since January and to lose is like taking a piece of our heart out. No one dreamed that these two schools would win the 2006 and 2007 BCS Championships.